Posted on November 15, 2016 at 3:19 pm. Jamie Odell has resigned from his position of CEO of Aristocrat Technologies. Aristocrat Technologies, one of the largest manufacturers of electronic poker machines in the world, is facing another hardship this week after CEO Jamie Odell announced his resignation from the company. News of Odell’s resignation sent Aristocrat’s shares tumbling 8.4% downhill, adding further insult to injury as the company struggles to retain a positive image amongst news of the court case alleging that Aristocrat pokie machines are purposely deceptive and designed to cheat players out of their money. 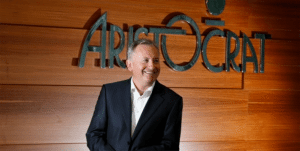 Mr Odell has been leading Aristocrat since 2009, and will formally leave the company in February 2017. He will be replaced by Aristocrat’s product boss, Trevor Croker, who will be based internationally as the company continues its focus on establishing itself within the North American market. Croker has previously worked as a sales director at Fosters Australia and marketing director at Beringer Blass Wines, but has spent the past seven years working closely with Odell in driving the success of Aristocrat forward. A media release sent to the Australian Stock Exchange from Aristocrat Chairman Dr Ian Blackburne said, “Trevor Croker is an outstanding leader who is widely respected both within Aristocrat and among our stakeholders, and will bring fresh perspectives to the role to drive the business forward. If the lawsuit against Aristocrat has anything to do with Odell’s decision to leave the company, he’s certainly keeping that close to his chest. Odell simply said it was the right time to leave given the excellent state of the business. Aristocrat is being sued by former pokies addict, Shonica Guy, who claims the company’s Dolphins Treasure machine has been intentionally designed to make players thinking they’re winning when they’re actually losing, employing tactics like near-wins to convince players to bet more money. Ms Guy is being represented by leading law firm Maurice Blackburn, with full support from the Alliance for Gambling Reform and anti-pokies politicians Nick Xenophon and Andrew Wilke. Crown Casino is a co-defendant in the case, and could face serious ramifications if the lawsuit goes in Ms Guy’s favour. Odell’s resignation comes at a strange time considering the company has reported solid profits during 2016 – a revenue jump of 66% in the first six months alone. However, given the lawsuit against Aristocrat, we can’t help but think Odell saw this as the best possible time to get out of the picture and wipe his hands clean of any impending responsibility that results from the outcome of the court case. If Aristocrat’s pokie machines are proven to be “rigged” as Shonica Guy is claiming, this could prove a serious problem for the company and the pokies industry as a whole. One thing’s for sure, a media frenzy and storm of bad publicity will ensue, in which case Odell has made a smart move by making sure he won’t be around to cop the brunt of it. They say there’s no such thing as bad publicity, but that certainly won’t be true if Aristocrat is proven to knowingly be cheating vulnerable players out of millions of dollars. In which case, it sounds to us like Odell has made the right choice.